Norwegian Cruise Line President & CEO Andy Stuart Embracing cruise guest. I was humbled to have had the honor of welcoming almost one thousand very special guests (along with a few furry family members) to Miami, as Norwegian Sky arrived on September 15th from a very important rescue mission in St. Thomas, bringing both stranded visitors and displaced residents who had their homes and livelihoods destroyed by this terrible storm. By now, we’ve all seen pictures of the devastation. I realize today that pictures do not begin to express the level of destruction and despair that people experienced. Hearing the stories directly from those who survived the storm and seeing the emotion and relief on their faces as they stepped off the gangway was a moment I will never forget. In our business, we work hard every day to create moments that will become lifelong treasured memories for our guests. 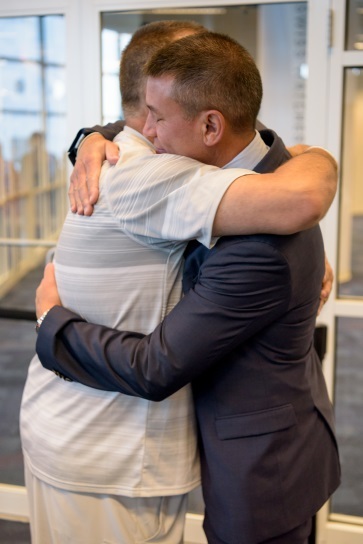 But this was an opportunity to do so much more than that, and our company’s leadership team, led by Norwegian Cruise Line Holdings President & CEO Frank Del Rio, didn’t hesitate for a moment when asked for help. The question wasn’t if we could go, but how fast we could get there. In my 30 years of working for Norwegian Cruise Line, it was my proudest moment. I would like to thank Norwegian Sky’s Captain Zeljko Jurac and Hotel Director Rohinton Mottahed for their outstanding efforts in ensuring our guests had a calm and enjoyable return to the mainland. I was further humbled as I heard more about the efforts of our hard working and dedicated crew members, who spent the 60+ hours of transit time to get to St. Thomas preparing everything they could to gather much needed supplies to offload once we arrived. The carpentry team gathered plywood, tarps, hammers, nails; housekeeping gathered clean sheets and towels; food & beverage spent days making and bagging ice (more than 160 oversized bags!) and providing disposable cutlery and plates; and teams gathered cleaning products and disinfectants. In all, 35 palettes of supplies were offloaded, including nonperishable food, ice, bedding, clothing and more. This also included 15 palettes of personal donations from our crew, with items such as toiletries and clean clothing. We are heartbroken to see the terrible impact Hurricane Irma has had on several islands in the Eastern Caribbean, ports that we have called on since the start of our 50 years in business. Now that our rescue portion of this devastating storm has concluded, we are working closely with our partners on the ground to determine the best way to continue to provide relief to the areas impacted by and recovering from Hurricane Irma. We are overwhelmed at the offers from so many of our guests and travel partners to assist and will have more details to share very soon.